The Broadway musical with the unfortunate title became a hit and won three Tony Awards in 2002. I saw the first national tour almost ten years ago and loved it. I don't remember much about the actual production, but the soundtrack has become one of my favorites and I've been waiting for a local theater to do a production of it. The wait is over! The Jungle Theater's new production is everything I could have hoped for. 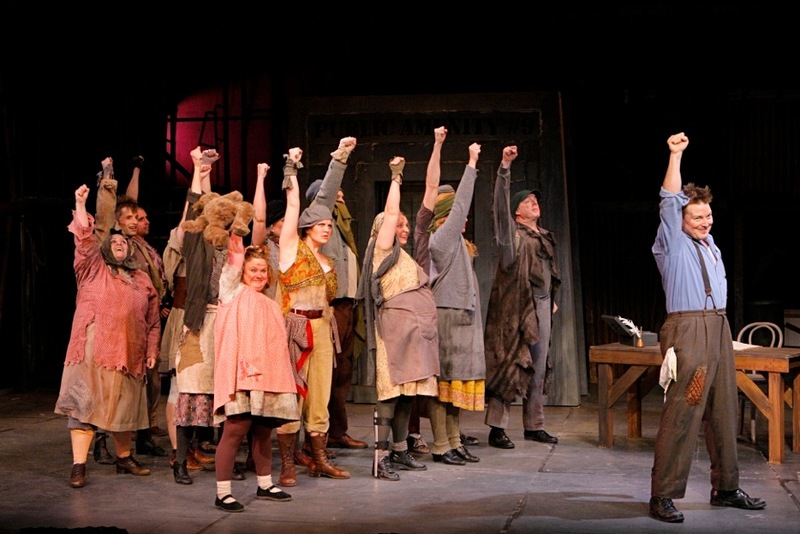 What is Urinetown? 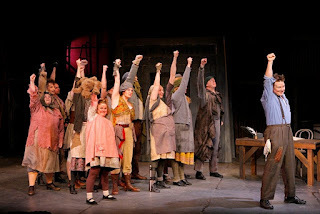 This Urinetown is biting social and political commentary, an homage to musical theater history and form, a fantastic score, great and inventive choreography, a truly wonderful local cast of almost two dozen, and hilarious. I told you a few days ago that Clybourne Park should be number one on your summer to-do list. Number two should be Urinetown. Or, well, I guess number one would be more appropriate. Either way, these two are both must-see shows! 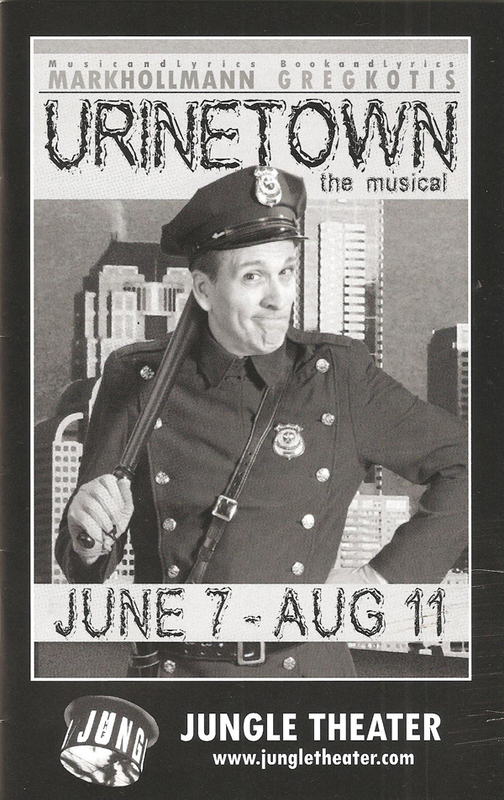 Urinetown is set in a dystopian future in which an extreme water shortage and corrupt businessmen and politicians have resulted in private bathrooms being illegal. Everyone must pay to use the "public amenities," with ever-increasing fees. The difference between the haves and have-nots is extreme, with the populace living in poverty and saving every penny, while the owner of Urine Good Company, which controls the amenities, and his pals live in luxury. (You see why this story is so great, and a little scary?) The story is narrated by Officer Lockstock (the incomparable Bradley Greenwald, who is blessed with a gorgeous singing voice as well as great comedic talent). 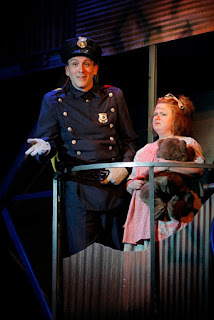 His sidekick, Little Sally (the adorable Elisa Pluhar), is constantly asking him tough questions. Their conversation frequently breaks the 4th wall as they comment on the show at hand. As Ms. Pennywise (the always fantastic Kersten Rodau) fiercely enforces the fees, the hero of our story, Bobby Strong (a likeable Patrick Morgan), decides that people shouldn't have to pay to pee, and leads them in a revolution to take back the toilets. Along the way he falls in love with the innocent and trusting Hope (a sweet -voiced Tiffany Seymour), daughter of the evil Mr. Cladwell (Gary Briggle, who revels in his character's dastardly demeanor). As we're told, this is not a happy musical. We don't get the happy ending we expect, but it sure is fun to watch it all unfold. Officer Lockstock beating the crowd with his club in slow motion. Perhaps the most beautiful and hilarious slo-mo fight choreography I've ever seen. I'm not even sure what else was going on in that scene, I couldn't take my eyes off the beating! All of the references to musicals in the choreography and score, including Les Miserables, Fiddler on the Roof, and West Side Story, with uncontrolled finger-snapping (my second-favorite West Side Story parody). Bradley's ridiculously long extended run on the phrase "down and out." Remembering that my favorite song in the score, "Run Freedom Run," is ever so much better live. This is the moment when Patrick completely won me over in his portrayal of Bobby. I wanted to stand up and join the chorus the he so enthusiastically directs! Every word that Little Sally says. So funny to hear such smart things come out of a "little girl." This: "Don't you think people want to be told their way of life is unsustainable?" The hugely talented ensemble that sounds amazing in the Jungle's intimate space - a full, gorgeous sound. Kertsen's delivery of my favorite lines - "it's blinding me!" and "you get it out of the clouds!" She's hilarious with a seriously powerful voice. The choreography by John Command (who also directs), which features many different styles and references. The Jungle's is a small stage, but this large cast moves with controlled chaos around it. The five-piece orchestra directed by Raymond Berg that sounds bigger than it is on this score with several different musical styles. The costumes (by Kathy Kohl), which range from charming but realistically shabby rags for the have-nots to slick suits for the haves. One of my favorite details was the signature pattern for the UGC, present in some small way on every employee. The clever character names, some of which are never heard onstage (that I remember). Lockstock and Barrel, Caldwell B. Cladwell, Hot Blades Harry, Penelope Pennwise, Little Becky Two-Shoes, and of course, the aptly named Hope. Last but not least, the set by Bain Boehlke. I can never not mention the set of a Jungle show because they're always so perfect. In this case, the stage is made as large as possible with scaffolding, ladders, boxes, and other junk around all sides. The public amenity door spins around to reveal Mr. Cladwell's office. 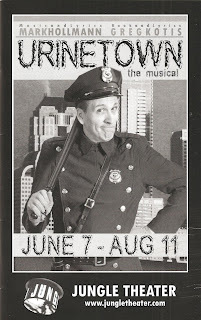 If you like classic, traditional musicals, Urinetown might not be the show for you. But if you like smart, funny, edgy, relevant musicals, go see what is sure to become the hit musical of the summer. Playing now through August 11, so you have no excuse not to get there.